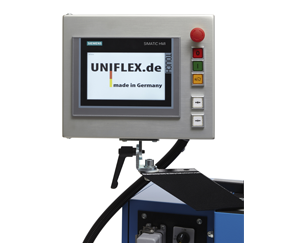 The Uniflex B-Touch offers full crimp machine control and settings for up to 1000 part numbers. Using Siemens technology the easy to operate screen allows full control and fast production processing of hoses assemblies. By storing crimp data the B-Touch provides continuity and fast election of pre-stored data. Using the additional option of UTS (Uniflex Transfer System) both crimp data and daily production can be down loaded or uploaded to and from CSV files. The new C.2 lean production control is now available with optional branded and personal step process. It is a fully integrated hose labelling software and printer able to print labels to include all hose information directly from the C.2 touch screen or a handy APP. Using the new C.2, users can download and upload both crimp data and production information. The new C.2 features additional production, quality and supervisor stop controls, plus an integrated digital caliper and / or microchip key stop / start. It facilitates full paperless communication, and production and crimp machines can be set to operate from a back office. The new menus (Quick start menu and Production menu) as well as the possibility of individualize each and every menu and application will make work much easier. Everything can be controlled vis HID, eg via Windows devices. You can record, monitor and assure the quality of your product and how the machine works via the PFM option. The system can produce colour coded hose exchange dates and customer branding, which can enhance the user’s preventative maintenance regime through improved asset management. -	Endless item memory - increases productivity and consistency. -	Item data easily searchable for faster set up of the next part. -	Data set filtering for faster production. -	Data sets can be read via scanner. -	Scanner menus can be linked to your production data set. -	Simple organization of changes, maintenance and management of production data sets. -	Central order management from the desktop saves time and money. -	HID-compliant devices eg external database, scanners, USB flash drive etc.